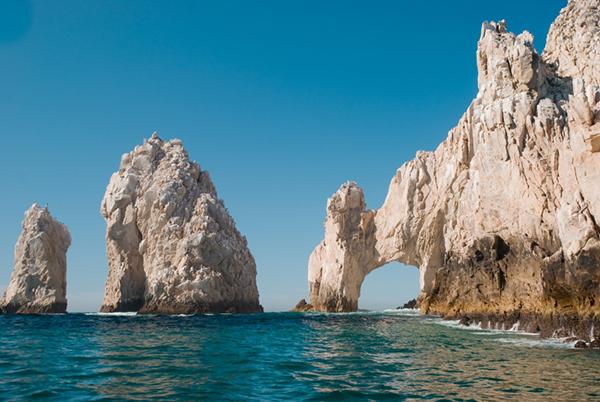 At the southern tip of the Baja Peninsula in Mexico lies beautiful Cabo San Lucas. Besides relaxing beaches and vibrant resort life, this is a terrific destination for active pursuits and family fun. Enjoy this selection of activities that combine excitement with gorgeous views for a “best of” what cabo has to offer. Please note that this is not an itinerary submitted by an actual family. This day was planned by one of our travel experts as a recommendation for a family of children with ages 7 through late teens, based on knowledge of the city. Factors such as time, cost and distance have been considered to make this a great day to get a sense of the city and keep the children and teens interested and engaged. Explore crystal clear waters and spectacular marine life in this exciting snorkel tour. After getting picked up from their hotels, visitors will climb aboard a zodiac boat for a scenic ride to Santa Maria Bay and Chileno Beach. After 30 minutes of snorkeling in each beautiful location, visitors will enjoy a delicious lunch at Lover’s Beach. The tour includes a visit to famous sights including Land’s End, the Arch and the Sea Lion Colony. The whole family will enjoy the breathtaking views both underwater and on land during this amusing snorkel tour. Enjoy an amazing bird’s-eye-view of spectacular Cabo San Lucas in this exciting parasailing adventure. Safety is first at Cabo Expeditions, which is the only parasailing provider in Los Cabos with all required safety equipment and guide certifications. The minimum age is 7 years old and children under 18 years must be accompanied by an adult. As the boat heads out into the bay, visitors will be fitted with a harness. The rest is simple, the boat does the rest. Depending on wind and water conditions, riders will soar up to 600 feet, taking in beautiful sights of Land’s End, Medano Beach and Cabo San Lucas Bay. Riders return to the boat dry, but there is also an option of skimming the water during your ride. On this Pacific Beach Horseback Ride, visitors of all ages will discover amazing ocean side cliffs, canyon trails, desert ranges and private beaches. After getting picked up from their hotels, visitors will arrive at Rancho Carisuva where knowledgeable tour guides will provide a brief orientation on the proper way to ride horses. Children will love exploring this Baja Californian ranch which has 43 horses, donkeys, goats and chickens. On the tour, visitors will see amazing wild animals, exotic desert plants and breathtaking views. If you are visiting Cabo San Lucas between January and March, keep an eye out for migrating whales traveling very close to shore!